Bella loves to review different foods and treats for different companies. When a package comes to the door she runs to meet the UPS or FedEx Driver and of course then she runs the other way. Sometimes foods taste good to her and other times she does not care for them. The particular food that she is tasting today was far too large for a cat, but perfect for a dog. Bella loves her treats, and I love rewarding her for being a great kitty! IF you recall, Bella is our kitty that has graced our home, she is just nine pounds small. These treats were not the ideal size for her, but they might be good for smaller dogs and larger cats. We cut these into smaller pieces before we served them to her, in order to help her because she really could not get them into her mouth. These are cat treats tested by Bella, she smelled them, she tasted them, and she requested more, but look at the size of those pieces, way too big for this little darling! When Bella did have the smaller pieces, she LOVED them and kept asking us for more! The Evanger’s Beef Liver Freeze-Dried Dog & Cat Treats are cubes of single-ingredient products that use whole muscle meat. The products are gluten-free, grain free and free of any additives and artificial ingredients. The product has a strong smell, and really attracted Bella to the container. 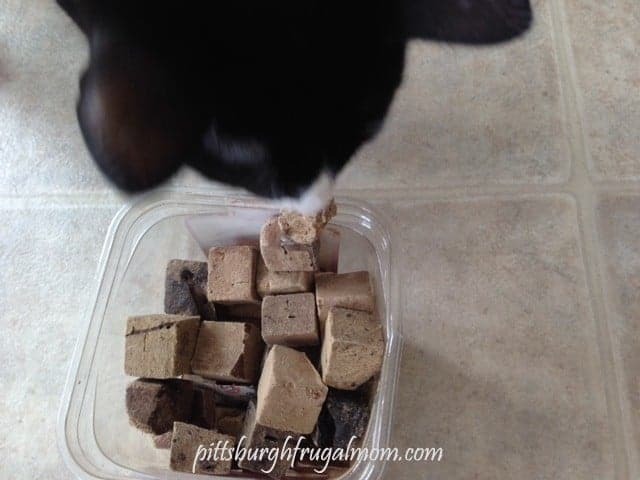 These could be used for training, or rewards, but if you have a smaller cat, as we do, you may need to cut these cubes into much smaller cubes because they are way to large for their mouths! Bella did enjoy this treat and I pretty much just have to take the lid off and she comes running to the smell of these treats. They don’t crunch, they actually moisten as she chews. The best way to serve these to a cat/kitten is to moisten them and cut them up. Again, the chunks in the container are way to large for cats to break down and eat in their mouths and the snack is very dry. We have found that adding a bit of water, and letting them moisten greatly helped our Bella enjoy these ‘mouth-watering snacks’. These do not have a nasty smell and because they make her so happy, they made us happy to serve them to her. If you are looking for a great snack for a larger cat or small dog, this would definitely make your pet happy! Lavishly living out loud with our kitty cat Bella and introducing a new snack sure to please!